As Facebook continues its efforts to clean-up its platform, and lessen its capacity to be used in divisive and damaging ways, The Social Network has this week announced that around 5,000 of its advanced ad targeting options will be removed as it seeks to stamp out discriminatory ad targeting. As you may recall, back in 2016, Facebook came under fire after an investigation showed that the platform’s advanced ad targeting options could be used to exclude people based on ethnicity from property ads, which is in violation of federal laws. 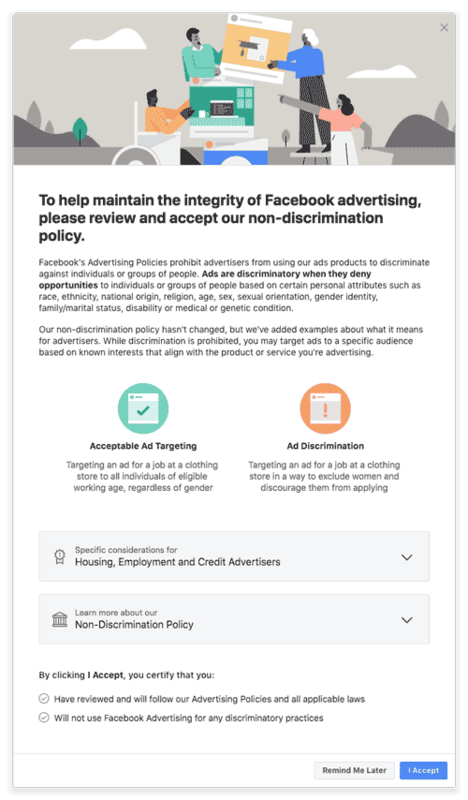 Facebook sought to address this early last year by updating its ad policies, and adding new enforcement tools in order to detect and remove such actions. But then Cambridge Analytica happened – part of the process the Cambridge Analytica team used to potentially sway voter opinions in the 2016 U.S. Presidential Election was hyper-targeting, honing in on very specific audience subsets with divisive content that played to their political leanings. The Russian-based Internet Research Agency reportedly did the same, infiltrating Facebook’s system by using its super-specific ad targeting tools against it. That’s what’s lead to Facebook putting this new squeeze on its ad targeting tools, and while it sounds like a lot – 5,000 ad targeting options is obviously significant – Facebook will still have a wide range of ad targeting options available, likely more than what any other ad platform can provide. As reported by BuzzFeed, among the options likely to be cut will be those tangentially related to religious beliefs and racial profiling. Indeed, among the many Facebook ad options, there’s a heap of ways you can hone in on very specific audiences, many of them not as overt as those highlighted in the above example on housing-related ads. In addition to this, Facebook’s also adding a new advertiser certification process. The certification will be expanded to all regions over time, giving Facebook another measure to enforce its policies and stamp out misuse.